To recap: I’m knitting the Market Jacket for NaKniSweMo. This photo was taken late yesterday afternoon. I am making progress. I won’t dare say I’ll make it but I am enjoying the heck out of knitting it. And for right now that’s pretty motivating. Well. That and my competitive nature. You’ve made a lot of progress on your Market Jacket in just two weeks. Whether the product gets done in November or not, enjoy the process! Gorgeous, gorgeous, gorgeous! That’s going to be one sweet sweater! You are going to town! LOVE the color and I’m impressed at your progress. You have a good chance of finishing! You might make it Carole, that’s pretty far along! I guess it’ll depend on how much knitting time you get around Thanksgiving. Love that pattern in the yarn you are using! That cardi is a very pretty design. I think it will be great on you, whether or not you finish it in November. Scrumptious yarn! It makes me think if Berocco Blackstone Tweed, but I think I remember that you are using something else. It will be such a cozy sweater. I like that tweed, I have a sweater’s worth myself. Does it soften as you work with it? Pretty, pretty, I love it! Nice progress and beautiful color! 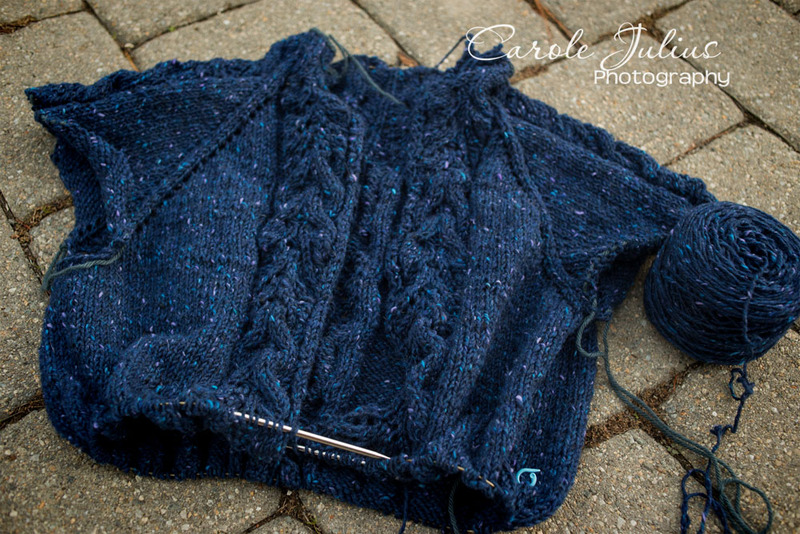 love the color and the tweed – Go, Carole, Go!! Wonderful design, fabulous color…how could you not enjoy knitting it?